Thanks to all the presenters for contributing to a good showing for Open Wonderland! To learn more about Open Wonderland, sign up for one of our upcoming workshops. You may have noticed that many of us are sporting nice Open Wonderland t-shirts. Maggie Leber, known as “Maggie Darwin” in Second Life, kindly created these for us as well as provided technical support and a place for us to stage our slides and rehearse together. If you frequent Second Life, and would like an Open Wonderland t-shirt, please contact Maggie. 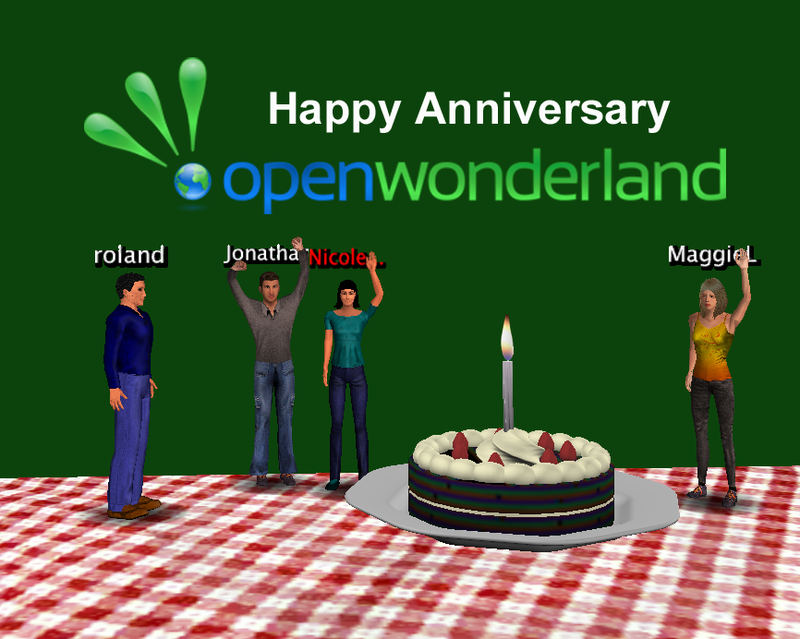 It’s hard to believe, but it was exactly one year ago today that we forked the Wonderland code and created the Open Wonderland (OWL) open source project. In honor of our first anniversary, I am pleased to announce that the Open Wonderland Foundation is sponsoring two new volunteer community efforts aimed at educating more people about Open Wonderland use and development. To help both people new to Open Wonderland and those who wish to increase their existing knowledge, we are establishing a series of educational workshops. The first two workshops are geared towards newcomers. One focuses on end-users who want to learn to build Open Wonderland worlds and the other on Java developers who would like to get started with Open Wonderland development. Due to space limitations, registration is required for all workshops. There is no charge for the workshops, but the registration form provides a place to add a donation to the Open Wonderland Foundation. All money collected will be used to expand the workshop series and provide other educational events. In this 2 hour hands-on workshop, we will cover the basics of creating an Open Wonderland virtual world. By the end of the session you will have learned how to use the basic features of the environment, how to insert 2D and 3D applications into a world, how to add images and presentations, and how to find and use 3D models from the Google 3D Warehouse. We will also cover how to enhance in-world objects with “capabilities,” and how to arrange the objects that you have added. This is a two-part hands-on workshop in which you will learn how to add new functionality to Open Wonderland by building modules that extend the Open Wonderland 3D virtual world toolkit. The first 1 hour session will cover everything you need to get started, including the basics of module development, their representation on the server and client sides, and how to set up your local machine to develop with Open Wonderland. In the second 1-hour session, you will learn the specifics of how to create a module. During the session, we will do a code walk-through of a sample module using an instance of NetBeans running inside the virtual world. If there is demand, we will run more of these introductory workshops in the future as well as begin to offer others on more advanced topics. Please leave a comment on this blog post if there are workshop topics you would like to see offered. In addition, anyone in the community that has expertise on a topic is invited to propose a workshop. Please send an email to info@openwonderland.org with your workshop idea. To provide Open Wonderland community members with more personalized help on specific end-user, world building, system administration, or developer questions, we are establishing “Office Hours.” More advanced members of the community are volunteering to be in-world for hour-long blocks of time so that anyone can drop in and ask questions. Office hours are ideal if you would like a general introduction to Open Wonderland, would like to learn how to use a particular feature, have a problem that you need help troubleshooting, or need advice on approaching some tricky technical issue. Volunteers are also happy to brainstorm about possible Open Wonderland project ideas, or ways to integrate Open Wonderland into your class or business. If you have Open Wonderland expertise you are willing to share, please volunteer to run one or more Office Hour sessions by adding your name to the schedule. The time and date is entirely up to you. The Open Wonderland Foundation welcomes contributions of all sorts. In addition to the volunteer opportunities mentioned here, we can always use help maintaining web pages, writing documentation, or managing community servers. Of course, code contributions are an important part of any open source software project, and we encourage developers to contribute 2D and 3D apps, new capabilities, bug fixes, or help with localizing the software in different languages. Finally, you can help us by making a financial contribution either when signing up for a workshop or by following the instructions on the Support Us page of the Open Wonderland web site. This conference takes place in Second Life and all times are listed in US Pacific time. Here is the line-up of Wonderland talks. The title links will take you to an abstract of each talk and the “world time chart” links will show the talk time in your local time. The SLURLs (Second Life URLs) will be published on March 13th on the conference web site. Please help us publicize these talks by re-posting this blog, tweeting about the talks, or posting them on your Facebook page. There are lots of other talks that sound interesting. The VWBPE Conference Schedule lists the entire schedule along with the in-world locations. You are currently browsing the Wonderblog blog archives for March, 2011.